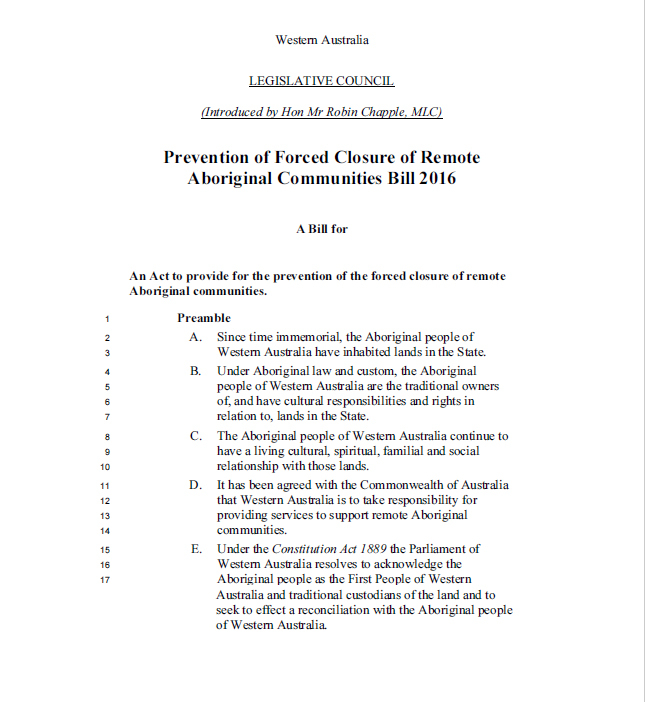 The purpose of the Prevention of Forced Closure of Remote Aboriginal Communities Bill 2016 is to prevent the forced closure of remote Aboriginal communities. It acknowledges that Aboriginal people in Western Australia are the traditional owners of the lands in the State, and have a living cultural, spiritual, familial, and social relationship with these lands. Furthermore, it seeks to hold Western Australia accountable for its agreement to take responsibility from the Commonwealth of Australia for providing municipal and essential services to support remote Aboriginal communities. Remote Aboriginal communities are communities wholly or principally composed of persons of Aboriginal descent as defined by the Aboriginal Affairs Planning Authority Act 1972 section 4, and are listed in the Government document entitled “Priority Investment Communities – WA”. Some of these communities may be renamed or known by a different name. Forced closure refers to any action taken without the free, prior and informed consent of residents that has the aim or effect of closing the community or relocating residents. It also refers to deterring people from living in the community through inadequate municipal or essential services. Municipal and essential services include power, water, sewerage, infrastructure, education, health services, and waste disposal. The Bill would require decision makers to adhere to the principles of the Declaration on the Rights of Indigenous Peoples, especially Articles 8, 9, and 10 which outline the right to belong to an indigenous community and to not be removed from lands; Articles 3, 4, 18, and 23 which outline the right to self-determination and self-government in matters relating to their own affairs and development; and Articles 19 and 39 which outline the right to develop their own health, social, and economic programs and to receive co-operation and support from the State. Should a public authority make a decision that leads to the forced closure of a remote Aboriginal community, which includes the inadequate provision of municipal or essential services, the Bill would enable residents to apply to the State Administrative Tribunal for a review of a decision to close their community. Residents must apply within six months after the decision was made; or if the community was unaware of the decision, six months after they became aware of it. Applications for review must be made in writing, or if made orally, put into writing by the executive officer as defined in the State Administrative Tribunal Act 2004 section 3 (1).